Getting out for walks with your baby is one of the best things new mums can do: you get fresh air, a bit of exercise, and the motion of the pram often soothes unsettled babies to sleep. It’s a great chance to either catch up with a friend (with or without their own children) or to enjoy some solitude. We’re so blessed on the Northern Beaches to have some brilliant scenic walks that are suitable for prams, so here is a rundown of some of our favourites. This is a classic favourite for good reason! It’s a flat walk from Queenscliff around to Shelley Beach and back, with great views over beautiful Manly Beach. There’s plenty of places to grab a coffee at either end or anywhere in between that takes your fancy. If your baby is getting a bit older, you can have a play at the fabulous playground at Queenscliff Lagoon, or make sandcastles at Shelley Beach! For a change from the ocean side of Manly, but still with gorgeous water views, the harbourside walk makes a lovely change and can often be much more quiet and peaceful. To avoid the stairs adjacent to Manly Pavilion, take the ramp to the right of the Manly Art Gallery, loop through the car park and then continue along the walkway, taking in Dalwood Beach on the way to Fairlight. Fairlight Beach is a brilliant beach for small children and walking there eliminates the frustrating problem of never being able to get a parking spot nearby! If you’re feeling energetic and don’t mind bumping your pram down some stairs, it’s easy to extend your walk around to beautiful North Harbour Reserve, which again has a great playground and a café just over the road. Fancy some whale watching as spring approaches? Park your car at McKillop Park at Freshwater headland (just next to Harbord Diggers) and cruise along to Curl Curl, keeping your eyes peeled for whales and pods of dolphins. You can either bump down some stairs to the boardwalk along the cliffs, or remain on the roadside footpath – both still give you the same lovely outlook. 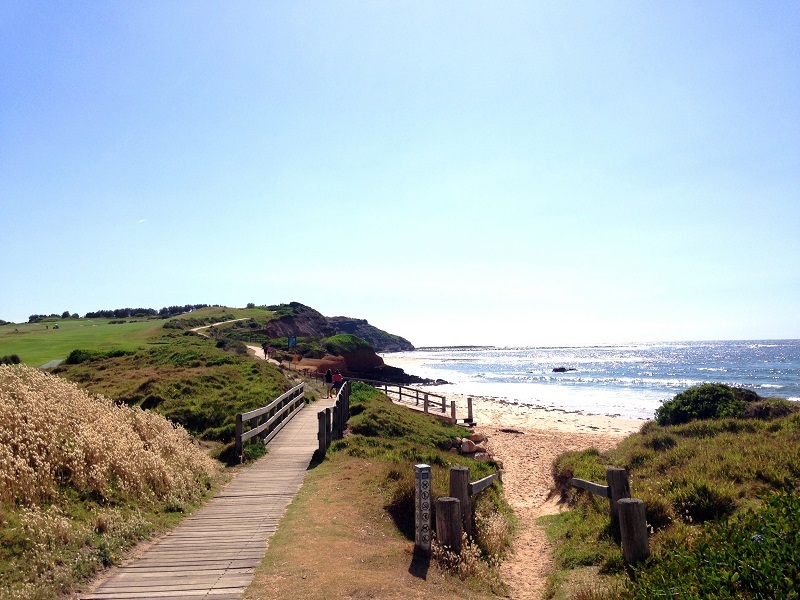 Unlike some of the other walks which require a return journey along the same walk, Long Reef provides the option for a circuit-style walk. It’s got a great hill to get your heart rate really pumping and a gorgeous view in all directions as your reward once you get to the top! We love parking near the boat ramp at Fishermans Beach, heading up the hill (bonus points if you do Nicky’s tricep burning pushes with the pram on the way up!). The path then continues along past the golf course and loops around back alongside Pittwater Road, then turn right at the playground past the tennis courts to get back to where you started. It’s now possible to do a full circuit of Narrabeen Lake, and it that is too much there are lots of options for places to park along the way and do a section of the walk. It’s also very popular for kids on bicycles and scooters, so is a great option for Babes with both a baby and a toddler. I love parking by the Tramshed and my big girl rides her bike around to Billarong Reserve while baby comes in the pram. We can stop for morning tea and a play before our return journey. Another great starting point on the other side of the lake is Jamieson Park. Where are your favourite places to go walking with a pram? Any great walks further north on the peninsula? Let us know your recommendations in the comments! Thanks to Angela Denly for this great blog post!